All human activity entails risk, and this is especially true for electrical power generation. We have seen the tragic deaths of coal miners as they worked to provide fuel for power plants that spew harmful pollution into the air. We have seen death and destruction in the distribution of natural gas, a highly explosive fuel that requires careful handling. I’m sure we can even find deleterious effects of clean energy like hydro, wind and solar. But no system of power generation has the lasting effects of nuclear power. Whereas the impact of a fossil fuel disaster can be cleaned up in a single generation, the residue from the inevitable nuclear accidents can be with our descendants for centuries. To compound this risk, the United States still does not have a comprehensive plan for the safe transport and storage of the tons of highly radioactive waste that are generated each year. That’s why it is so discouraging to read that the Nuclear Regulatory Commission (NRC) recently granted twenty year extensions of the operating licenses for the two aging nuclear reactors in New Jersey’s Lower Alloways Creek Township. 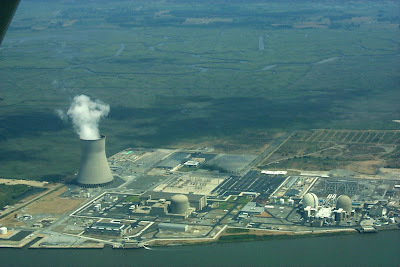 The two reactors, known as Salem 1 and 2, went into operation 34 and 30 years ago, respectively. There’s a third reactor on the same site, Hope Creek, which is of the same design as Fukushima reactor number 1. Its operating license expires in 2026. The only other reactor in New Jersey is Oyster Creek in Lacey Township, one of the oldest operating reactors in the nation. Let’s for a moment compare nuclear power risks to those of another activity – passenger air travel. Over the years, air travel in the United States has become extremely safe. The number of fatal accidents by US passenger airlines in 2010 was zero, as it had been in two of the three previous years. Despite the cutbacks in airline spending, US air carriers and the FAA practice rigorous safety standards. Yet, despite these comprehensive procedures, there was a fatal crash in Buffalo in 2009 that killed 50 people. A tragedy for sure, but outside of the immediate coterie of family and friends, that accident had no lasting effect. People who fly balance the risk of flying vs. the convenience of getting to their destination in a timely manner. Since statistically, flying is safer than driving, those who fly make an informed risk vs. reward decision. Now, consider a nuclear reactor event. Chernobyl and Fukushima will have a lasting impact on Ukraine and Japan for generations to come. Acres of land will be uninhabitable for decades if not centuries. Cancers and other radiation-induced health problems will affect people who are not even born yet. Events of the past decades show that there’s a high risk in nuclear power. The reward is touted as “cheap” electricity. Notwithstanding the fact that the published cost of nuclear power rarely includes the cost of decommissioning plants and remediating sites, the risk vs. reward balance skews toward the risk side. 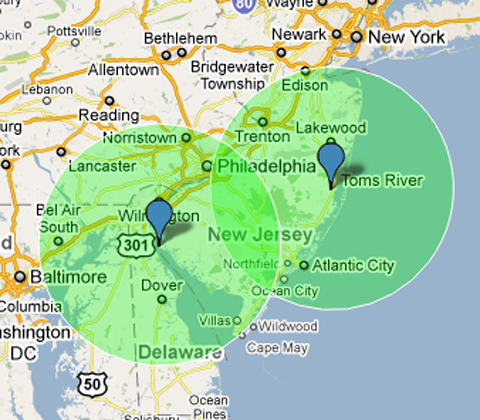 Consider the two sites in New Jersey. The NRC recommends a 50 mile evacuation radius in the event of a serious accident. This figure shows the area that would need to be evacuated in such an event. About 5.5 million people live within that radius of the Salem and Hope Creek plants. About 4.5 million people live within 50 miles of Oyster Creek. 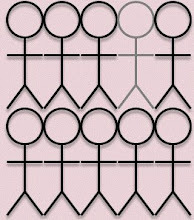 In the event of a disaster, evacuation of that many people would be chaotic, expensive, and nearly impossible. No matter how much regulation and inspection are imposed on New Jersey’s nuclear plants, the probability of a major accident is not zero. The risk clearly outweighs the reward, and it would be in the best interests of New Jersey and all of the United States if instead of renewing these licenses for aging plants, we let the licenses expire (like we are doing at Oyster Creek) and start to decommission these ticking time bombs. We would not be the first to have such an enlightened strategy. Germany has committed to shutting the lights on its nuclear plants and filling the gap with renewable energy. America was once a great country that could set a goal and achieve it successfully. No such endeavor told this story as much as President John F. Kennedy’s 1961 charge to land a man on the moon by the end of the decade. The space program created thousands of jobs, boosted America’s commitment to science and math education, and resulted in thousands of ancillary developments that benefited consumers around the world. Today, President Obama can issue a similar bold challenge – replacement of 50% of our fossil fuel usage (including nuclear) within a decade. Naysayers will opine that this is impossible and too expensive. Tell that to Neil Armstrong. We can let events drive us, or we can drive events. Now is the time to eliminate the risk of long-term contamination of our precious environment. Let’s stop automatically renewing nuclear plants’ operating licenses and have a full-court press to lead the world in renewable energy.